The Shopify Integration - How does it work, and how do I set it up? – How can we help? The Vend-Shopify Integration enables you to link an online Shopify store to your Vend account easily. If you are new to selling online, the integration makes it easier when setting up your first store, and makes it easy for you to manage sales, inventory, and reporting. If you have a Shopify store, you can use the integration to streamline your operations by managing your inventory and sales reporting in a single system. You can think of the Shopify integration as an extra store-window for one of your Vend outlets. When you turn on the integration, the Shopify store, links to one of your Vend outlets. You can pick which of that outlet's products are shown online. Shopify will show available inventory levels from the linked outlet. When a customer makes a purchase in your online store, it will be recorded in the linked outlet in Vend, and your inventory levels are updated. When a customer makes a purchase in the linked outlet, or you complete a stock order, transfer, or stocktake, your Shopify store will automatically be updated. Important: Integrating other apps, such as inventory managers, with your Shopify store may cause problems. Please test this thoroughly before switching on another integration to your Shopify store when linked with Vend. Any third party integration that changes your prices, SKUs, or handles will cause problems. Once you've saved the settings, you're ready to go in Vend. Important: Don't unlink and re-link your stores unless you're planning on deleting all items from your Shopify store and starting from scratch. 3. Add beautiful images and other details needed for online sales, such as weight, in Shopify. Will my photos in Vend show in Shopify? The first time you publish a product to Shopify, we'll also publish the primary photo in Vend for that product. 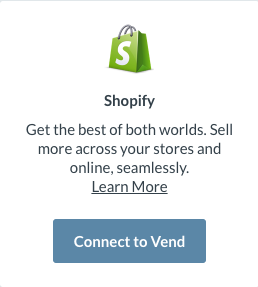 Shopify will only pull across the main picture of a product from Vend. If you have any additional pictures attached to any of your Vend products these will need to be added to Shopify manually. How will my variant and composite products display? Complete an order, transfer, stocktake, or stock adjustment in the Vend outlet(s) linked to your Shopify store. When the order (or transfer, stocktake, stock adjustment) is completed in Vend, the changes will be updated in your Shopify store. Note: If you have a lot of products, especially in a stock-take, these changes may take some time to update your Shopify store. I ordered stock into my store and it isn't showing! If it isn't, you'll need to transfer the inventory into a Shopify-linked outlet. My store is sold out online, but I have inventory! Check that the inventory is in your Shopify-linked outlets. If it's not, transfer the inventory to one of those outlets. The sold amount reduces the inventory level for that outlet. You need to fulfil the order on the Shopify order fulfilment page. When you link your Shopify store, we'll create a Shipping Charges product. Each Shopify order with shipping charges will have this product, with your shipping charge amount, added to the sale. If you accept payments made via bank deposit, the sale from Shopify will be sent to Vend at the time the order is made. The sale balance will show as unpaid. When you edit a product in Vend, Shopfiy will automatically be updated when you save the changes. This will update ALL fields for the product, other than images, and Shopify specific fields, like weight and compare-at price. Sometimes, updates take a while to process. If the update does not publish after 1 hour, contact our Support Team. You can toggle the visibility of a product in Vend if you do not wish to display it in Shopify anymore. This can be useful if a product is seasonal, or you no longer sell the product currently but may sell it again at some point in the future. To hide a product, navigate to the Products screen in Vend and find the product you wish to disable. How do I delete a linked product? I want to delete the product from my Vend store AND my Shopify store. To delete the product in both your Vend and Shopify store, always delete the product in Vend. This will automatically update your Shopify store. Do NOT manually delete the product in Shopify. I only want to delete the product from my Shopify store. In Vend, click the Unpublish button on the product page. This will break the link with Shopify. The item will still appear on your Shopify store at this stage. Next, delete the item from your Shopify store. Vend Loyalty cannot be redeemed via Shopify and can only be redeemed in-store. We do not recommend using Vend Loyalty and Shopify at the same time.